Puppies should be fed 4 meals a day, bringing this down to 3 meals a day at the age of 4 months until your pup is 6 months. It is important that the puppy is fed a diet designed for its age and breed size. There are diets specifically designed for puppies and young dogs which will ensure the growing dog receives the nutrition required for healthy growth and bone development. Browse our puppy food here. For dogs of 12 months or older, feed 1-2 times a day. 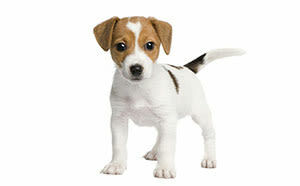 Small breeds burn energy quicker than large breeds and should be fed 2-3 small meals a day. Little and often is key! Browse our dog food here. It is better to stick to one variety of good quality “complete balanced” dog food and not add any supplements unless instructed by your vet. Over supplementing can be harmful to your dog. Be wary of overfeeding. Not all dogs can or need to eat the amount recommended by the food manufacturers. The right amount should produce firm, dark brown, crinkly stools. If the stools are firm, but get softer towards the end, this is a classic sign of overfeeding. Never change your dog's diet abruptly (unless under the direction of your vet). If you want to change its diet, do it gradually over a period of 7 - 10 days. Do not feed your dog before travelling in the car as this can encourage car-sickness, or an hour before or after exercise as this could contribute to a stomach dilation and torsion (also known as bloat) which is a life threatening condition requiring immediate veterinary intervention. Medium to large breeds of dogs should be fed from a raised bowl to prevent them from swallowing air while they eat, which can also contribute to bloat. For owners of breeds who are thought to be susceptible to this condition, you should seek advice from your breeder or vet on further precautionary measures. Leave your dog in peace while it is eating from its bowl. Taking the bowl away while it is eating causes anxiety, which can lead to aggressive behaviour. If you want to be sure that your dog is comfortable with you approaching it during mealtimes, add a little food to the bowl while it is eating, so it sees you as an asset, rather than a threat. Never feed your dog from the table or your plate, as this encourages drooling and attention seeking behaviours such as begging and barking. Make sure that water is always available to your dog, so never take its water bowl away. Choose a high-quality dog food like Canine Choice and look at the recommendations on the label. Most high-quality dog foods recommend approximately 1-1/2 cups per 10kg of body weight per day for smaller breeds, since they require 15-25% more calories per pound than larger breeds. Large and giant breeds are more often fed 1 cup per 10kg. Does the amount to be fed in the feeding guidelines pertain to each meal or the daily amount? How accurate are the feeding guidelines on my dog food label? The manufacturers’ recommended feeding guidelines are rarely accurate and should only be used as a rough starting point. Most guidelines vary considerably depending on the manufacturer. This means there is little consistency between brands. Your dog's age, health, reproductive status and exercise level will influence the amount of food your dog should receive. If in doubt always consult your veterinarian. Pet food ingredients must be listed on the label in descending order by weight. The first 3-4 ingredients should be given in a percentage to indicate the quantity. However, this weight includes the moisture in the ingredient, which makes it tricky to interpret. Similar materials listed as separate ingredients may outweigh other ingredients that precede them on the list of ingredients. All of these factors should be taken into accoun when deciding the quantity of food that you give your dog. How should I determine what to feed my dog? Choose a high-quality food as poor quality foods produce more waste, can cause digestive problems and often end up being more expensive (because to satisfy your dog you will need to feed him comparatively more). It is important to know your dog’s weight as well as the ideal weight of its specific breed. You can always consult with your veterinarian if you are not sure about the ideal weight for your dog. The next stage is to determine the dogs activity level, remember to factor in all variables (exercise level, age etc) and any additional calorie intake like treats. The starting amount of food can then be adjusted accordingly. After you have started feeding your dog an appropriate amount of food, weigh your dog at least once a month to determine if you are on the right track. If necessary, increase or decrease the amount of food slightly until the dog stays at his ideal weight. Most dogs are overfed and under-exercised so, if in doubt about how much to feed initially, feed a little less. How can I stop my dog from rushing his food at meal times? Dogs that gulp their food down too quickly tend to take in large amounts of air whilst eating which can cause stomach and digestive system upset. This can be avoided by placing a large object such a ball in the bowl to encourage him to take smaller bites, or there are some treat dispenser toys available that have built-in obstructions and cause the food to be released slowly. If you have more than one pet, feed them separately to reduce competition for food. How should I go about introducing a different food to my dog’s diet? Your dog will need to be introduced to the new food gradually as the number and type of bacteria in the intestines, which assist in digestion, can be changed and their ability to digest the food may be affected. Because dogs can often be sensitive to changes in their diet, try and make any transition as smooth as possible. Start by mixing the new food with your usual brand, before gradually increasing the proportion over seven to ten days until your dog is only eating the new food. The amount of new food should be decreased if the dog shows any signs of vomiting, has soft stool or appears constipated. Is it ok to give dogs healthy table scraps? It is always best to feed your dog treats that are specifically developed for dogs and to only use them to aid with training. However, you can feed leftovers providing they do not comprise more than 10% of your dog’s diet. Although many owners do, it is not recommended to feed your dog scraps, as it's almost impossible to create a well-balanced diet from these. Never feed fatty scraps as these may cause your dog to gain weight. Uncooked vegetables such as carrots, peas, green beans and broccoli are low in fat and provide a good source of vitamins and fibre. They should still be fed in moderation or as a treat as dogs are not well equipped to digest a lot of fibre and it can cause stomach upset. Raw meat can be infected with bacteria, and bones can damage teeth and cause obstructions in the gut. It is also not ideal to feed your dog cat food as, since it is designed for cats, it doesn't have the right balance of vitamins and minerals for dogs. Never feed dogs chocolate as it is toxic to them. Feeding table scraps can encourage your dog to beg during meal times and steal foods from the table, some of which could be hazardous to his health. What foods should I avoid feeding my dog? Chocolate contains theobromine which can cause increased heart rate, restlessness and vomiting. In large doses it may be fatal. Grapes and raisins are toxic to dogs and can cause renal failure. Onions may cause anaemia, vomiting, diarrhea, stomach pain and nausea. Such poisoning is particularly dangerous in Akitas but all breeds can show signs of toxicity. Garlic is also part of the onion family. In large doses it may cause dermatitis and asthma. Some owners, however, use garlic tablets as a natural flea repellent. Always follow dosage instructions carefully. Lactose, which is found in milk and dairy products, cannot be digested by dogs. Fruit can be high in sugar and can also be acidic. This will upset your dog's digestion if overfed. Avocados and cherries should be avoided but others such as strawberries, apples and blueberries can be given in moderation. They are packed full of vitamins, fibre and antioxidants. Feeding potatoes are not recommended due to their high starch content, which is not easily digested by dogs and may cause problems. Many common household and garden plants and flowers such as the Daffodil can also be toxic to dogs, causing anything from skin irritations to severe poisoning and death. Should I feed my dog a breed specific food? A dog’s nutritional requirements depend on many factors including the breed, activity level and age. It is important to choose a diet that fits the unique health requirements of your dog. Breed specific foods can be key to maintaining the health of your pet. In the example of Labrador Retrievers, they are prone to eating quicky and weight gain. A Labrador Retriever specific diet is made with lower calories and has a unique kibble shape that slows down their eating speed. Should I avoid feeding my dog grains? Not all dogs need to be restricted from eating grains. But if you have an itchy pet or a pet who has frequent digestive issues such as diarrhoea, you could try feeding a grain-free diet. Grains are packed full of nutrients and can be highly digestible, too. The key is in the quantity and quality of the grains in your pet’s food. So while meat should be the first and main ingredient, grains can be beneficial too. Lower quality pet foods tend to be high in grains and cereals and low in meat. They may also contain fillers, such as, modified cornstarch and soybean meal, which have little nutritional value. If you are in doubt about what to feed your dog, you can speak to one of our Animal Health Advisors on 0203 675 0780 (Mon-Fri) or ask your veterinarian for advice. You can browse our breed specific dog food here.